The most gentle soap for the most sensitive little ones (and grown-ups too for that matter!!) - made from soothing ingredients like organic olive oil, corn starch and oatmeal. This soap has no essential oils and no colorants, so it's extremely gentle with a light natural scent. If you suffer from sensitive skin issues, give this soap a try. As with all my soaps, there are no artificial ingredients and only the best oils make up these luxurious bars that are unlike anything you can find at your typical store. 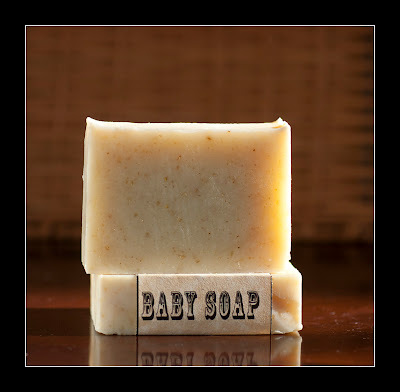 Don't put commercial soaps full of chemicals on your baby, us all-natural organic soaps like this one.